The Doclea's (Dukljanski) period, which dated from the IX to the end of the XII century, was probably the most prosperous one in the history of Montenegrins. With the rise of feudalism between VIII and IX centuries, which signified an end to blood related, tribal associations, the (Sklavinija) Doclea (Duklja) gradually became a Principality (Knezevina -Arhontija) in the second part of the IX century. 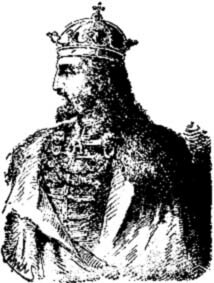 The first known prince (knez-arhont) was Petar. In 1884 a lead stamp was found, on which was engraved in Greek "Petar prince of Doclea". In addition, it also was engraved with the Madonna with Christ, and the word "amin" after Petar's title and two crosses. This is a very important finding, since it confirms not only that Doclea (Duklja) was a principality (Byzantine vassal), but also that Petar was a christianized Slav prince. This implies that Docleans (Dukljani) were christened before the beginning of the Slavic mission of Cirilo and Metodije in the second part of the IX century (V.Nikcevic, Crnogorski jezik, 1993). Similarly, according to D. Zivkovic's findings (Istorija Crnogorskog Naroda, Cetinje, 1989), Doclea was christianized by the middle of the IX century and this period is characterized with the spreading of Latin literacy and culture. In 1016, Doclea is ruled by the first known nominally independent prince Vladimir (son of Petrislav). From 1018-1043 the Principality of Doclea (Duklja) was ruled by Vladimir's nephew Stefan Vojislav who was a Byzantine vassal until 1041. After defeating Macedonian rebels and regaining Drac, Byzantium, helped by prince of Zahumlje, head of tribal state Bosnia, and ban of Serbia, attacked Doclea (Duklju) in 1042/43 from all sides (J.Skilica).The attackers suffered heavy defeats (35 000) in Tudjemili, near Bar, and the Byzantium Czar was forced to recognize the Doclea's (Duklja) independence, and forge friendship and alliance with Mihailo, the son of Vojislav, giving him the title of ? (protospator)(J.Jovanovic, Stvaranje Crnogorske Drzave i Razvoj Crnogorske Nacionalnosti, Obod, Cetinje 1947, p. 11). Thus, victory of Prince Vojislav over Byzantium in Tudjemili near Bar in 1042/43 signified liberation from Byzant control, and he became sovereign of Doclea (Duklja) which is in Byzant sources called Zeta after this battle. Zeta, thus, was the first of the South Slav states to be recognized as a sovereignty by Byzantium and this began the thousand year history of the Montenegrin state. The sovereignty of Zeta encompassed Raska, Bosnia, Travunia (Travunija), and Zahumlje (Dragoje Zivkovic, Istorija crnogorskog naroda, Cetinje, 1989). Doclea/Zeta was ruled by princes until 1077, when pope Gregory (Grgur) VII sent the king's insignia (rex Sclavorum) to Mihailo who became the king of Doclea/Zeta. Consequently Doclea/Zeta became a kingdom (Dukljansko Kraljevstvo). The image of King Mihailo with his crown is still found in the Church of St. Mihailo in Ston, a town in the Peljesac peninsula (in present-day Croatia). In a letter from 1077, the Pope refers to him as "Michaeli Sclavorum Regi" (Mihailo, King of the Slavs). Together with the recognition of Mihailo as King of Zeta, the Pope also considered his request that Duklja's bishopric in Bar be raised to an archbishopric. After an unsuccessful challenge of this request by the rival archbishoprics in Dubrovnik and Split, the Pope (Clement III), on January 8, 1089, issued a bull to Mihailo's son King Bodin raising the Bar bishopric to the status of archbishopric, with ten subordinated bishoprics and Archbishop Petar as head. It comprised bishoprics (episkopije): Dukljanska (Barska), Kotorska, Ulcinjska, Svacka, Skadarska, Drivatska, Pulatska (Pilotska), Raška, Bosanska, Zahumska, Travunijska, and all the Dalmatian (catholic), Greek, and Slavic (in Raska orthodox Old-Slav speaking bishopric) monasteries . Duklja's power and prosperity, thus reached their zenith under Vojislav's son, King Mihailo (1046-81), and his son King Bodin (1081-1101). The enlargement of the Doclea's state and the consolidation of its power was achieved by the mighty King Mihailo. The state expansion was achieved at the expense of Bosnia and Raska (the precursor of present-day Serbia). Mihailo made his son Petrislav to be the vassal ruler of Raska. By marrying the niece of the Byzantine emperor Constatine IX, King Mihailo departed from the policy of wars and hostilities of his father toward Byzantium. King Mihailo died in 1081 putting an end to the impressive 35-year reign. He was succeeded by his son Bodin who emerged as a victor from a brief power struggle for the throne. In that power struggle he sent his brother Dobroslav and his close cousin Kocopar into exile bringing Zeta closer to Raska (J.Jovanovic, Stvaranje Crnogorske Drzave i Razvoj Crnogorske Nacionalnosti, Obod, Cetinje 1947, p. 11). Bodin continued the successful policies of his father enlarging his state and establishing vassal states in Bosnia (under Stefan) and Raska (under Vukan and Marko). The Vojislavljevics' era, however, was set on a declining path by the death of King Bodin in 1101 and the subsequent power struggle. 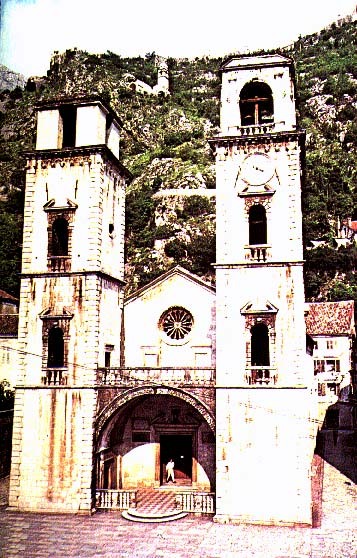 In the second half of XII century, the church of Saint Triphun was built in Kotor. This church was built on the foundations of an old church (mentioned in so called Andreacijecu in 809, and, according to legend, ruined during Samuilo's conquest of Kotor in 998 (Dragoje Zivkovic, Istorija crnogorskog naroda, Cetinje, 1989). The church of Saint Triphun is one of the most important sacred buildings of the mature Romanics on the East coast of the Adriatic (ibid.). During the 80s in the XII century (1183 the latest), anunknown Doclean Benedictine priest (Pop Dukljanin), wrote the famous "Kingdom of Slavs" (Kraljevstvo Slavena) also known as Regnum Sclavorum and sometimes called Ljetopis Popa Dukljanina. According to Zivkovic (ibid. ), this work is the oldest source of domestic provenience for the history of Doclea; it is written in local Slavonic (Doclean/Zeta's/Montenegrin) language. It has reached us in the Latin transcription (ibid.). Acknowledging that the notion the Montenegrin (Crnogorski), was not found in Doclean period, V. Nikcevic uses it as a synonym for Doclean/Zeta's (Dukljanski/Zetski) and states that the Montenegrin language in that period had already had its phonologic, morphological, and syntax structure, built up on the Ancient-Slavonic or South-Slavonic linguistic basis (V.Nikcevic, Jezicki i knjizevni znacaj crkava s podrucja Skadarskog jezera, Skadarsko jezero, CANU, Titograd, 1980). Similarly an other Montenegrin historian writes that "during the centuries, since Dukljanin's 'Kingdom of Slavs', it was created rich, written and spoken literature, in, objectively, Montenegrin language (D. Radojevic, Etnicke odrednice jezika- Naziv nije neutralan, Vjesnik, br, 14999, Zagreb, 1989). Contrary to these views, another Montenegrin historian, denies that the term nation, in Dukljanin's 'Kingdom of Slavs', is used in an ethnical sense (D. Vujovic, O ethnogenezi Crnogoraca i marksistickom odredjenju nacije, Praksa, br 4, Titograd 1981, p73).